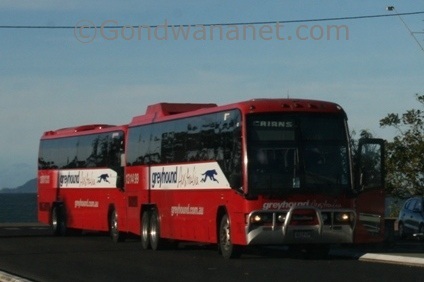 Below is a driving trip planner for Australia. Australia is a huge country full of interesting things to see so it is a good idea to plan how to get around in Australia before you leave home. Below is information on domestic flights, bus and train travel in Australia, car and camper van hire, and where to buy and sell a second hand car or campervan. If you haven’t got a lot of time but still want to visit some famous Australian destinations that are far from each other, you may have to consider taking domestic flights. It’s not the cheapest option, but it can save you a lot of time. Plan your trip with Travel Australia Planning Guide - a site that focusses on planning your Australia trip. Train travel is not as popular in Australia as it is in Europe, and trains don't take you to nearly as many places in Australia as they do in Europe. But some parts of Australia are well worth doing by train, beacuse there are some great long train jorneys that give you an excellent opportunity to see the vast Australian outback deserts if you don't want to drive yourself (You may want to have a look at International rail passes that include Australia). There are also some famous shorter train jorneys through rainforest, such as the Scenic Railway in Kuranda in north Queensland, the Puffing Billy Steam Train in Victoria and the West Coast Wilderness Railway in Tasmania. Long distance bus travel is more popular, particularly amongst backpackers, and the main reason for that is that buses take you to a lot more places than trains. You can do the eastern coast of Australia (by far the most popular coast with backpackers and international travellers) by train, but buses stop in more places, particularly in backpacker hangouts (such as Mission Beach only to name one example). Buses are also cheaper than trains, however they are not more comfortable - if on an overnight trip, you have more room for your legs on a tilt train than on Greyhound buses. However, if you want to drive, you can take your freedom to a different level altogether! Stop where you want, stay how long you want, and forget about timetables. There are many different car rental companies, but the most popular are the larger companies such as Avis, Hertz, Budget, Europcar and Thrifty. You can now quickly and easily compare them all on this page about rental cars Australia. The next step that gives you even more freedom is to get off the bitumen and get to do the dirt tracks. It is possible to rent four wheel drives in Australia, they are more expensive than two wheel drives, but if you want to do some back tracks you have the opportunity. And there are different ones. The four wheel drive on the photo below is the kind that would have some restrictions as to what tracks you are allowed on (and usually the most exciting ones are banned). 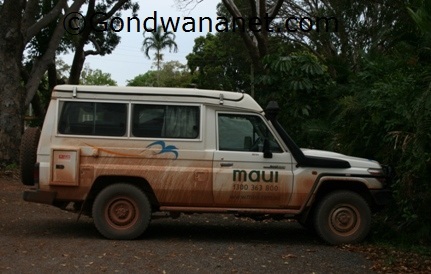 If you hire a proper landcruiser trooper, like on the photo below, you likely have no or very little restrictions. It also means roughing it much more, with less space inside, or probably even sleeping in a tent. This is how I like to travel! 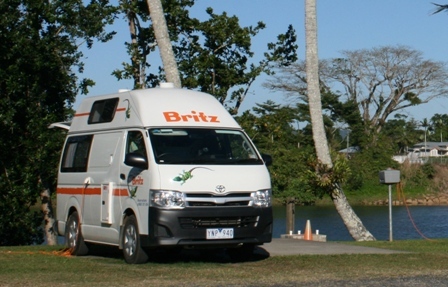 Many backpackers and international travellers buy a car or a campervan in Australia, do the trip, and sell it after the trip. It may take you some time to sell it, but depending on how long time you intend to spend on your trip, it may be cheaper than renting (the longer the more worth-while of course). The eastern coast being a very popular backpacker route, Cairns and Sydney, in each end of it, are very popular places to buy and sell such vehicles (look into Kings Cross Carmarket in Sydney; as well as Travellers Auto Barn and Car Connection that make buy-back deals).